A rash is a change in the skin’s color or texture. Simple rashes are called dermatitis, which means the skin is inflamed or swollen. Contact dermatitis is caused by touching an irritating substance such as clothing materials and dyes, latex, cosmetics, soaps or certain plants like poison ivy. Seborrheic dermatitis forms red patches and scaling, usually on the face and head, where it is more commonly known as dandruff or cradle cap. Other common rashes include eczema, psoriasis, impetigo, shingles, chicken pox, measles, scarlet fever, insect bites and those caused by medical conditions such as lupus or rheumatoid arthritis. 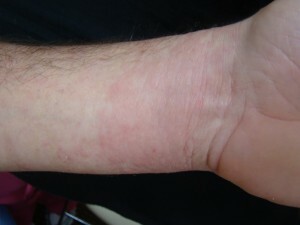 Rashes are common in Florida. They can be caused by contact with plants, animals, soaps, chemicals, as well as being one of many viral or bacterial skin diseases, like impetigo, pityriasis rosea, seborrheic dermatitis, secondary syphilis and many others. Dr. Kaminester and his staff pride themselves on sorting out these many possible causes of “rash” and then giving the patient the appropriate treatment. Sometimes a biopsy is needed to confirm the diagnosis. Dr. K is usually able to take a very small, almost painless piece of skin to do this, and the excellent independent dermatopathology laboratory will often have the result back in two working days or less. These small red spots or bumps can be very itchy. They develop when the sweat ducts in the skin are clogged and perspiration cannot properly take place. Wearing loose, lightweight clothing can help prevent this type of rash. Cooling the skin through air conditioning or use of cold compresses and hydrocortisone creams should alleviate the itching if you are stricken with heat rash. Caused by too much exposure to either the sun or UV lights in tanning beds, PMLE typically results in itchy red areas on the chest, arms, neck or thighs. Use sunblock regularly to avoid this rash. Over-the-counter anti-inflammatories, hydrocortisone cream and cold compresses can provide relief of symptoms until the rash goes away. These plants can trigger a reaction in many people that results in blistering, itchy, swollen skin. For those who enjoy camping and hiking, try to avoid any plants with leaves growing in groups of three. If you do come into contact with poison ivy or oak, cleanse the skin with soap and water immediately. Once the rash has formed, you will most likely require a prescription medication to counter the symptoms. Dr. Kaminester has picture books of plants poisonous to people to help you identify the plant so you will be able to avoid contact with it in the future. 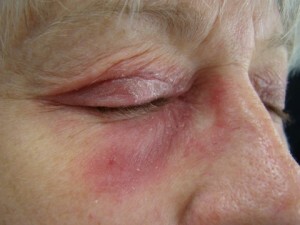 Visit our page about specifically about Contact Dermatitis for more information.